Five (5) Grand Prize: Each Grand Prize is a $5,000.00. Prize will be awarded via ten (10) $500 prepaid cash cards. 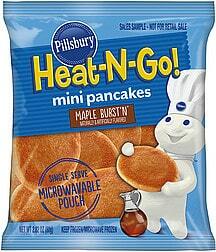 One Hundred (100) Second Prizes: a coupon for a free package of any variety of Pillsbury Heat-N-Go pancakes.